Once the decision is made to upgrade the lighting in an RV to LED's, the task of methodically replacing the bulbs begins. This TechTip will guide you through the process of replacement in many of the common RV lighting fixtures. The most common fixture is a single or double fixture containing one or two 1141 or 1156 bayonet base bulbs in a single or double plastic fixture. These simply requires the lamp cover sides to be gently squeezed together and the cover slides off exposing the bulb. You can use a similar LED replacement bulb, however many find a flat array type of bulb is a better choice since when it is properly placed all of the LED's are facing away and all light is focused away from the fixture in a 120 degree arc. Some LED arrays are bayonet based and other have multiple wire connectors which can fit almost any of this type of fixture with base adapters to fit the bulb socket. The array of LED's is attached to the fixture using double sided tape, then the lens is reinstalled. Another type of ceiling light found frequently in modern RV's is the flat glass "puck" type light. The standard bulb in these fixtures is a 10 watt halogen bulb, mounted in a metal fixture that secures the glass. Often these are mounted into the roof material and there frequently are 30-60 lamps in a larger RV. 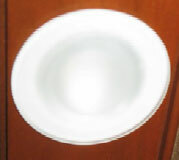 The glass plate is rotated counterclockwise less than 1/2 turn to release it from the metal base. 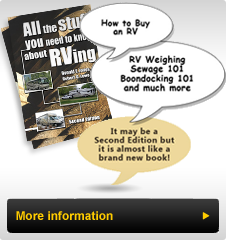 RV Technicians recommend using the palm of your hand and pressing up and rotating the glass. This works however it does require considerable strength and being close enough to the fixture to effectively push on the lens. We have found that a pair of rubber faced work gloves or a rubber jar gripper pressed onto the glass face assists in removing the glass. Occasionally the glass will be "sealed" over time to the vinyl roof material or difficult to remove because the heat on the roof makes it difficult. On a cool morning a stubborn glass can often be removed on before the roof is warmed by direct sunlight. Using the blade of a 1" putty knife laid flat against the roof and gently press it in under the glass all the way around to release the glass cover. Then use a pair of gloves to pull the two pin halogen bulb from the fixture. If the removed bulbs are to be used again, then using gloves prevents the oil from your hand from etching the glass, which may weaken it and make the bulb susceptible to shattering when it warms up. Once the old bulb is removed look at the connector spacing and adjust the spacing of the two pins on the LED. They will need only minor bending to fit into the socket. You may need a stool to get close enough to the fixture to see the small receptacle holes that the new LED plugs into. We recommend that you do a test of all lights on the same circuit to ensure that all bulbs are properly seated and connected then re-install the covers. There are situations where just moving the LED bulb slightly will allow it to work properly. Wall sconces, reading lights and dinette fixtures using have access from the top or bottom to the light bulbs directly. Some fixtures have enclosed bulbs which are accessed by removing a small metal retainer at the bottom of the hanging fixture. It is rotated to loosen and the metal part comes off then the glass cover is removed and the bulbs are exposed for exchange. challenges. These fixtures are mounted high up on the wall and the initial impression is that the metal band holding each glass cover can simply be removed. This band is actually bolted to the metal base of the lamp. The simplest way to retrofit bulbs in this type of fixture is to remove the retaining screws on the metal base and lower it so that the individual bulbs can be removed. They are mounted on an angle as can be seen in the second photo. Some bulbs will protrude above the glass however it is rarely noticeable since the fixtures are mounted up so high that one does not see the bulb tip. There are some bulbs specifically designed to fit this type of fixture however special purpose bulbs can be more expensive and difficult to find, Ensure that all wiring is tucked under the metal base, then reinstall the mounting screws. The ground connection is usually the white wire going to the ballast from the power connection from the RV's power source wiring. There is no need to cap the ballast side since it is now "dead". The white or black wire (depending upon make) from the LED tube wire harness is connected to the RV (white) ground wiring. The two harnesses (one for each tube) are placed in such a way that they do not block the tube's light and also installed in such a way that the ballast cover between the tubes can be re-installed. In some situations a small notch can be cut in the metal cover for this wire. In other cases a hole large enough to allow the connectors to pass through will need to be drilled or the harness can be fed through the opening at one end. Each fluorescent fixture brand is different, thus it is impossible to give a definitive procedure for this step. Check that the LED's light with the power switch on both at the fixture (and on the wall if supplied). Then install the tubes, and ensure that they do not dim when installed. If they do, TURN OFF the lights and follow the instructions in TechTip #76. If there is no change in light intensity, orientate the tubes in the fixture to direct the light downwards and install the cover once again. As you complete the process of replacing the light bulbs with LED's you will begin to appreciate what a wonderful improvement you have made in the quality of the lighting, the energy reduction and the modern look inside your RV. Some of the lights in your RV may be controlled by dimmers. While higher quality LED's, with an 11 to 18 Volt or 8 to 30 Volt operating range, should be able to be dimmed, you may notice some operational variations from that of the original bulbs. If the dimmers found in the RV are electronic "Touch Pad" type, often found in high end luxury RV's, you should not see any operational difference. The electronic controls will vary the lighting as you depress the pad and the lights will dim and brighten in a linear fashion just as they did before the upgrade. If you have mechanical "slider" type dimmers, you will likely notice some operating differences. We have seen the lights go from bright when the slider is at maximum to dimming as the slider is brought down towards the dim side of the dimmer, then brighten again. The light may vary greatly in a relatively small movement of the dimmer slider. There are good electrical reasons for this: Incandescent dimmers vary the voltage on the "hot" (12 Volt positive) side of the lamp. With a traditional bulb this does not make any difference. However with LED's which are miniaturized electronic circuits with diodes that emit light, this variation in voltage on the positive power source lead can disrupt the functions of some of the electronic circuitry causing erratic dimming. The suppliers of dimmers to the RV manufacturing industry have developed an Original Equipment Manufacturer (OEM) styled dimmer that looks and works the same as the factory original however it requires on additional wire coming from the ground circuit of the RV. Generally speaking this is not a difficult replacement and with this new dimmer in place the LED's will dim just as the original incandescent lights did. If you need a linear dimming function then contact RV Parts Plus for the replacement component. The other characteristic we have noticed when "Dimming" LED lamps is that some brands emit a definite "humming sound" when the voltage is reduced using conventional dimmers. For one or two bulbs over a TV with the sound of the TV to mask this hum, it is not a problem. However should you be dimming the large number of ceiling lamps found in today's RVs this sound will be very irritating. Check with the sales personnel where you are buying your bulbs to determine whether the replacement LED bulbs can be dimmed and confirm that they are "quiet" when dimmed. While it is difficult to cover all the various replacement bulb and fixture combinations this article has tried to address a broad spectrum of replacements. At times it may make sense to replace the fixture(s) rather than the bulbs (especially in RV basement storage bins). Check out the options for this area on our website. The quality of the lighting, the longevity of the bulbs and the modern efficient look of LED lighting upgrades will make the effort to make the upgrade worthwhile.